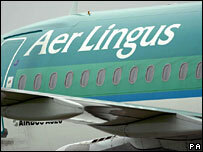 Irish state-owned airline Aer Lingus has priced its initial public share offering at 2.20 euros (£1.73; $2.79). The price will give Aer Lingus a market value of 1.13bn euros when trading in its shares begins next month. The Irish government, which owns 85.1% of the airline, is selling more than 50% of its shares to investors. The share pricing - which is at the lower end of market forecasts - is expected to raise about 501.8m euros, the airline said. According to reports, citing one of the advisers on the deal, the offering was 3.8 times oversubscribed. About 104m euros will be used to reduce the airline's pension gap, while the rest will be used to expand its operations. The company is scheduled to begin trading on the Dublin and London stock exchanges on 2 October. It will mark the first airline flotation on the London Stock Exchange since Easyjet's debut six years ago. Aer Lingus will be issuing 208.4 million new shares in the firm as part of the float.